It is stainless steel with ivory coloured handles. 6 x Tea Spoons. 6 x Table Knives. Crafted from the highest quality stainless steel, each piece features a colourful resin handle and the trademark Laguiole Bee on the side. Laguiole cutlery is like no other. Crafted by hand in Laguiole, France. Beautifully crafted Lou Laguiole cutlery set with black handles. Cutlery Set Features include This set will add a special touch to any dining experience. 6 x table knives 233mm full length. Laguiole cutlery is like no other. Crafted by hand in Laguiole, France. Features the trademark Laguiole Bee on each handle. Debutante Cheese Knife Set features Handles made from coloured resin. 21cm Cheese Cleaver. 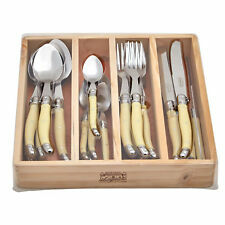 Beautifully crafted Lou Laguiole cutlery set with ivory-coloured handles. Cutlery Set Features include This set will add a special touch to any dining experience. 6 x table knives 233mm full length. Laguiole by Louis Thiers steak knives are heavier and stronger than many of the other ranges of Laguiole cutlery available in Australia. 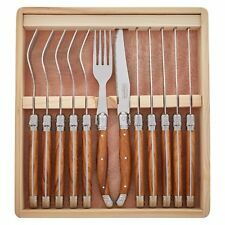 GENUINE Laguiole by Louis Thiers Lineaire Cutlery Set. There are a number of makers of Laguiole cutlery. Made from 430 quality inox Acier Stainless Steel and ABS food safe handles and presented in a traditional pine wood box, in the best of Laguiole tradition with the signature Bee motif. A superbly crafted vibrant cutlery range. NEW Andre Aubrac Laguiole 6 Piece Steak Knife Set in Multi - Laguiole - Cutlery Sets. Laguiole 6 Piece Spoon Set by Jean Neron - Choose your colour. Cutlery. Crafted from the highest quality stainless steel, each piece features an olivewood handle and the trademark Laguiole Bee on the side, a symbol of quality and authenticity. Laguiole cutlery is like no other. Each piece is masterfully crafted from stainless steel & finished sumptuously with stainless steel bolsters, five-rivet handles, and the traditional Laguiole Napoleon bee. Full tang construction ensures expert balance and superior durability, while modern resin handles make them maintenance-free. 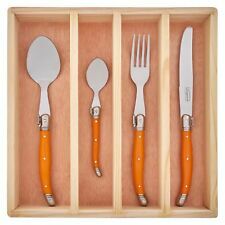 NEW Laguiole by Louis Thiers Luxe 6 Piece Steak Knife Set in Lidded Box - Laguiole - Cutlery Sets. • Manufactured from High-Grade Stainless Steel, Chateau Laguiole Cutlery is long lasting and versatile • The recognisable and sought-after design is perfect for both special occasions and daily use. Chateau Laguiole is the only SGS approved Laguiole available • The 12-Piece Steak Knife & Fork Cutlery Set consists of 6 x Steak Knives & 6 x Forks. Manufactured from 430 stainless steel, the knives are 1.5mm thick and the forks are 1.8mm thick • The ABS handles are food-safe and functionally ergonomic. Made from high grade stainless steel in the best of Laguiole tradition with the signature Bee motif. Comprises 6 Steak Knives and 6 Forks in a timber presentation box. A superbly crafted vibrant cutlery range. Crafted from the highest quality stainless steel, each piece features a resin handle and the trademark Laguiole Bee on the side. Laguiole cutlery is like no other. For opulent dining, look for Laguiole. Laguiole by Louis Thiers steak knives are heavier and stronger than many of the other ranges of Laguiole cutlery available in Australia. GENUINE Laguiole by Louis Thiers Carnaval Cutlery Set. There are a number of makers of Laguiole cutlery. Crafted from the highest quality stainless steel, each piece features a resin handle and the trademark Laguiole Bee on the side – a symbol of quality and authenticity. Laguiole cutlery is like no other. 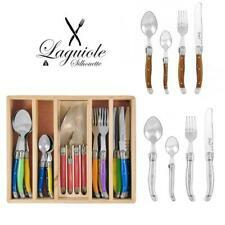 NEW Andre Aubrac Laguiole 16 Piece Cutlery Set in Multi - Laguiole - Cutlery Sets. Proudly handmade in France, the 24-piece Laguiole by Andre Verdier Debutant Mirror Stainless Cutlery Set, in matte stainless steel and featuring the famous signature Laguiole Bee, is easily recognisable. Made from high grade stainless steel in the best of Laguiole tradition with the signature Bee motif. 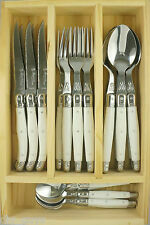 Comprises 6 Steak Knives and 6 Forks in a timber presentation box. NEW Laguiole by Louis Thiers Toujours Black 24 Piece Cutlery Set in Tray - Laguiole - Cutlery Sets. Andre Verdier brings French elegance to your table with the Laguiole by Andre Verdier Debutant Salad Spoon Set. Handcrafted from finest quality stainless steel, each piece has stainless steel bolsters, five-rivet handles, and full-tang construction for durability.